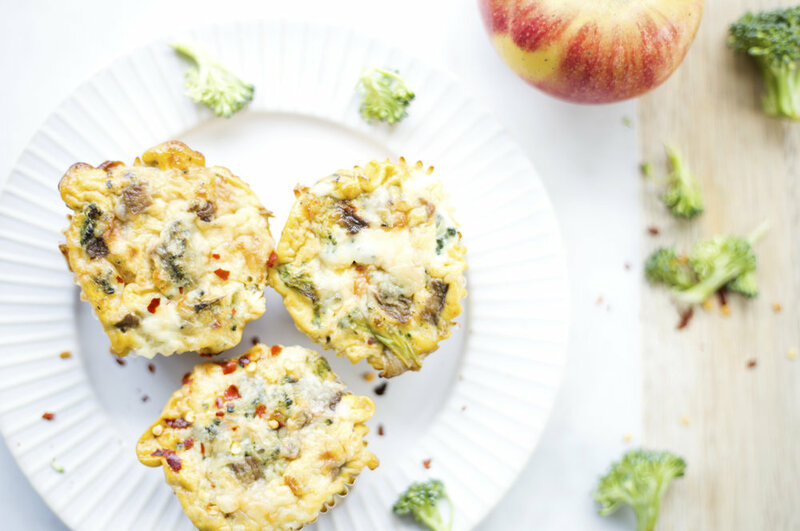 Egg muffins are a life saver for any lady needing a solid dose of protein and energy, but they're especially clutch for new mamas needing satisfying one-handers. These mighty muffins are easy to make in big batches and they save well, so make a bunch and store extras in the freezer for a later date. Preheat oven to 400°F. Line muffin tin with silicone liners or non-bleached paper liners (option to grease the muffin tin instead, but we can't promise they won't stick). Add broccoli, salt and balsamic to the onion and saute until broccoli is tender. Set aside and let cool to room temp. In large bowl, whisk the eggs, then stir in mustard and cheddar cheese (saving 1/4 cup grated cheddar for the top). Then stir the veggies into the eggs. If you like a kick, include the red chili flakes (highly recommended). Ladle or spoon the egg batter evenly among the muffin cups (yes, it can be a drippy mess, that's ok. To avoid the drips, you could ladle egg batter into a pitcher or glass measuring cup and pour batter into each muffin tin, but that means more dishes to clean, so not necessary). Fill each tin ~3/4 full then sprinkle the remaining 1/2 cup grated cheddar across the top of all the muffins.